Design engineers often specify rackmount chassis for industrial computer systems. These cases fit into horizontal racks, providing the ability to position multiple servers with one over the other. 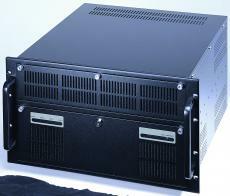 The rackmount design saves floor space, allowing for highly efficient operations whenever multiple servers are required. 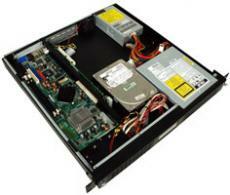 RACK-1150G 1U - This RoHS compliant chassis is designed for a full size PICMG 1.0 single board computer. It features two front-accessible USB ports, 5.25” and 3.5” HDD drive capacities, and three 3 cm cooling fans. RACK-2100GB 2U - Our RACK-2100GB brand accommodates full size PICMG 1.3 single board computers (SBCs). 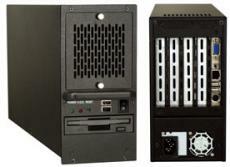 These six slot chassis have two 8 cm fans and three drive bays: a front-accessible 3.5”, a 3.5” HDD, and a 5.25” bay. The design is eye-pleasing with a stylish front panel and keylock. RCK-405 4U - Featuring five drive bays and a lockable door for maximum protection, these 4U units support PS/2 size PSU and include a retaining bar for use with an ATX motherboard or a 14 slot backplane. They also feature anti-vibration card clamps. RACK-500G 5U - A 5U chassis that accommodates half and full size single board computers alike, this RoHS compliant unit is compatible with a full range of SBCs. These include PICMG 1.0 and 1.3 computers as well as PCI and PICOe units. 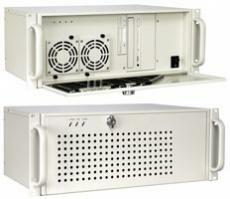 Each five slot chassis includes two drive bays and an 8 cm cooling fan. The list above represents a small sample of our offerings, with numerous other rackmounts available in 1U, 2U, 4U, and 5U sizes. Contact our representatives today to find out more about our rackmount chassis or to request a custom quote.